Hello! How is life? I've been a hermit in my night float state, a rather lonely two week rotation, but it's nearly over and overall it really hasn't been all that bad! I've even managed to catch some winks every now and then, and melatonin has proved effective for some daytime sleeps. But I'm ready to go back to a regular schedule, please and thank you. And, given the hermit life I live at the moment, I've got pretty little to update you in terms of life. Earlier last week, I forced myself to stay awake and went on a little date with Andrew to one of my of favoritest areas in Chicago. Then I napped and started The Handmaid's Tale when I woke up, and honestly? I'm not sure I'll finish. I feel weird watching it? Plus I'd rather read the book? On a less depressing note, I also watched La La Land while eating Thai food and it was glorious. Consider me a Damien Chazelle fan (he directed Whiplash too, which is also an amazing film if you're looking for sometime to watch your next Friday night in). Other than that, I bonded with my class at the nearby arcade bar and meal prepped a little for the week. I feel like life has been pretty normal and uneventful, but I kinda like it that way! I also purchased a planner after a bout of inspiration that hit me after a hot yoga session last week. During this particular day, I was feeling pretty tight going through the stretches (it's been a while) but the instructor kept reminding us to go back to our intentions. And those little reminders were everything, because it's so, so easy to forget when you're out of your element. I definitely had lapses even in that sweaty, one hour session. But her gentle reminders were one of those deals where if you repeat it enough to yourself, it will eventually just "be". And I figured that with the start of the new year, it would be worth taking that practice beyond the studio and into real life. So I bought a pretty, girly planner and I've been writing down reflections at the end of each day. I focus on the stuff that makes me thankful, and then write down the same reminder every day: Be chill. Relax. It works out in the end. It really does. I also just really like having the physical notebook too. It feels like a throwback to the early 2000s when you had to have one for school, but with less sparkly gel pens. Plus it makes me less forgetful and I like seeing what's planned for the upcoming week. Like our upcoming intern class retreat (yay!) and a bowling birthday party this weekend (double yay!) And it helps me decide when I can sneak in a baking sesh for myself amidst all the work and fun times. Speaking of baking, it's no secret that I've been on a real savory kick - the house has the lingering scent of salty, buttery biscuits and I've grated more cheese in these past two weeks than I have probably my entire life. 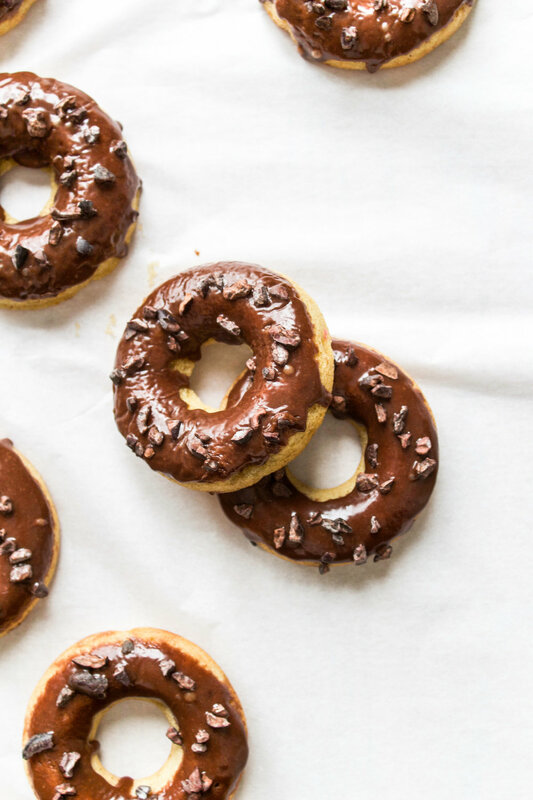 But in between all that I've still managed to squeeze in these donuts, because when early January rolls around I get a wee bit nostalgic and think back to the beginnings of this little blog. 3 years of layer cakes and other random treats, my moody ramblings, and pictures of Andrew's face in different cities. I've learned how to bake biscuits and scones, make the whole process of pie baking as minimally stressful as possible, and salvage terrible bakes. I've started a hashtag on Instagram (#tinyasiansgetdonuts 4 lyfe) and made some more wonderful blogger friends. It's been a ton of fun sharing my stories and what I've learned in my 20s so far. I hope you've enjoyed it too. 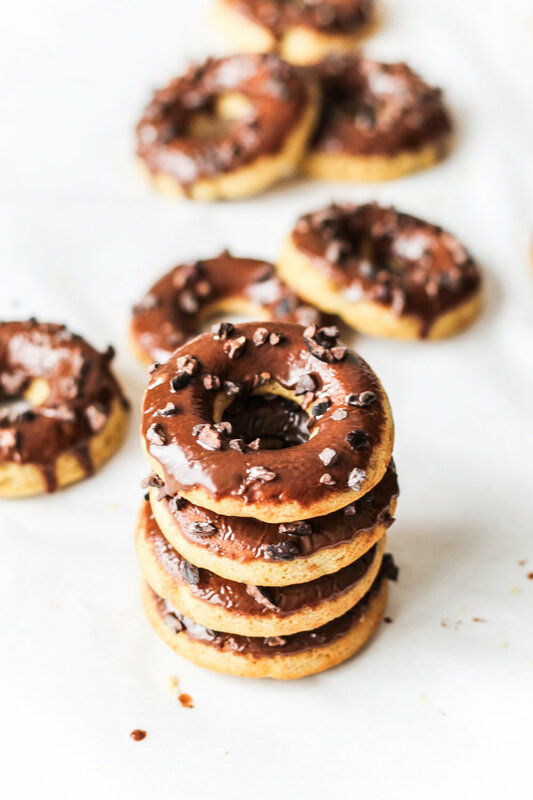 So to celebrate, here are some cute donuts - banana goodness with a simple Nutella glaze and topped with crunchy, slightly bitter cacao nibs. I like them because they offset the sweetness of the whole donut but if you would like to go ham with regular sprinkles, that wouldn't be a bad idea either. In a medium bowl, whisk the flour, baking powder, kosher salt, and nutmeg until combined, then set aside. In a large bowl, whisk the bananas, sugars, and unsalted butter until fully incorporated. Whisk in the egg and vanilla extract until smooth. Add the flour mixture to the wet mixture and whisk until it is just combined. If you have a piping bag, I recommend scooping your mixture into a bag fitted with a round piping tip, then, using that to fill your donut pan! But you can just spoon in the mixture as well. 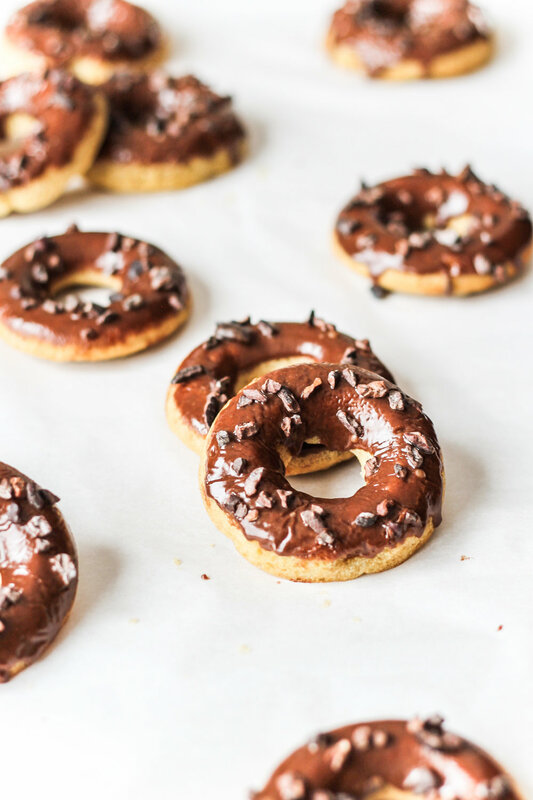 Place the donut pan in the oven and bake for 12-13 minutes, until it is slightly springy to the touch. Remove from the oven and let sit for 1 minute. Then, quickly turn over the donuts on a cooling rack. Let cool completely before glazing. 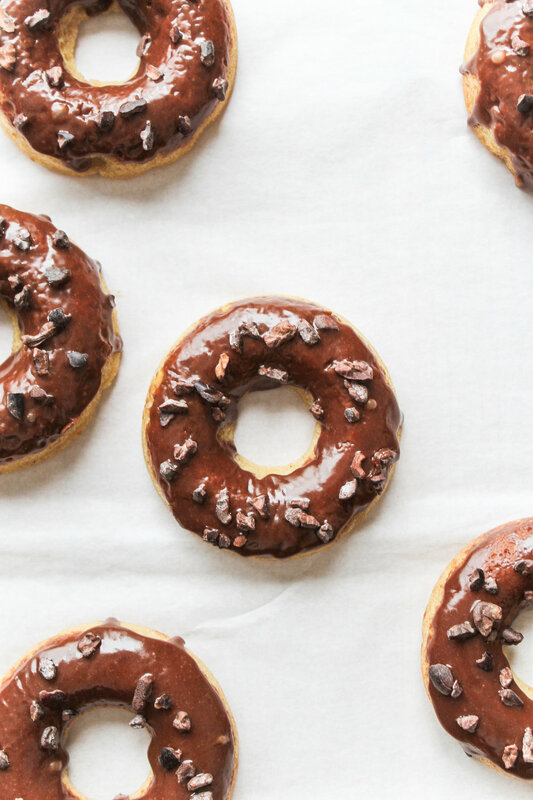 For the glaze, whisk together the Nutella, powdered sugar, and milk until combined. Keep in mind, if you want the donut glaze to not be drippy, it would be good to err on the side of less milk! Place a cooling rack above a sheet pan (to catch the drips, in case). Once the donuts are cool, dip each donut into the glaze, allowing the excess to run off before placing on the rack. Top with your sprinkle of choice. Thank you for all the love and support the last three years!